If you love the 80s, you’ll love this book. 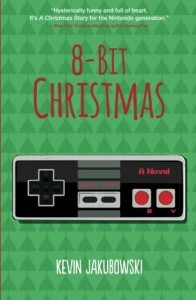 8-BIT CHRISTMAS fondly reminds me of A CHRISTMAS STORY, but instead of Ralphie asking for a Red Ryder BB gun, Jake Doyle wants a Nintendo NES (and his sister wants a red-headed Cabbage Patch Doll). References from the 80s abound: Garbage Pail Kids, Inspector Gadget (and Dr. Claw), Muppet Babies, Cindy Lopper, Care Bears, GI Joe, the Pizza Hut BOOK IT! program, and even the Power Glove! And this is only a fraction of 80s references included. As with A CHRISTSMAS STORY, this story is narrated in the first person perspective of a grown-up protagonist reflecting upon his childhood Christmas memories. The book kicks off with Jake’s rich family friend Timmy Kleen receiving a Nintendo NES. Soon, every boy in the third grade begins clamoring for their very own NES. As with A CHRISTMAS STORY, familiar hilarity ensues. Humor is the thing that keeps this book going strong until the end. I noticed a few small nitpicks: the congruency of 80s releases; first person descriptions when the protagonist isn’t in the room; and pausing the plot progression. But really, it all boils down to one thing: humor. For instance, it’s okay when the protagonist pauses the plot as he escapes into his imagination of competing for an NES on Double Dare, or when two there’s a page of bantering “yes, huhs”—because it’s delightfully funny (and it brings back fond memories). I was pleasantly surprised by how sentimental and warm the book concluded. There were hints of this while the protagonist was running around the streets of Chicago, but everything wrapped up pleasingly well at the end. Kudos to the author for giving such a satisfying conclusion. Be sure to keep an eye out for the future works of this book’s author, Kevin Jakubowski. He has a movie and some Comedy Central credits to his name, but there is also an unnamed upcoming series on Nickelodeon in the works that hopefully will be as funny as the book. For fans of the 80s, you may want to check out READY PLAYER ONE; it’s Science Fiction, but has a slew of 80s throwbacks. Special Thanks to DB Press for providing me with a review copy of this book.